We’d love your help. Let us know what’s wrong with this preview of Perfectly Reasonable Deviations from the Beaten Track by Richard Feynman. "One of the towering figures of twentieth-century science, Richard Feynman possessed a curiosity that was the stuff of legend. Even before he won the Nobel Prize in 1965, his unorthodox and spellbinding lectures on physics secured his reputation amongst students and seekers around the world. It was his outsized love for life, however, that earned him the status of an Ameri "One of the towering figures of twentieth-century science, Richard Feynman possessed a curiosity that was the stuff of legend. Even before he won the Nobel Prize in 1965, his unorthodox and spellbinding lectures on physics secured his reputation amongst students and seekers around the world. It was his outsized love for life, however, that earned him the status of an American cultural icon - here was an extraordinary intellect devoted to the proposition that the thrill of discovery was matched only by the joy of communicating it to others." In this career-spanning collection of letters, many published here for the first time, we are able to see this side of Feynman like never before. Perfectly Reasonable Deviations from the Beaten Track covers a dazzling array of topics and themes, scientific developments and personal histories. With missives to and from scientific luminaries, as well as letters to and from fans, family, students, crackpots, as well as everyday people eager for Feynman's wisdom and counsel, the result is a de facto guide to life, and eloquent testimony to the human quest for knowledge at all levels. To ask other readers questions about Perfectly Reasonable Deviations from the Beaten Track, please sign up. Our love affair (read: my infatuation with you) started blooming years ago when I happened upon your lectures. Your wit, charm and intelligence was the triple combination that wooed me into bewilderment. For years I devoured anything I could find about you. I swooned over tales of your bongo skills. Your grace and humility when accepting the Nobel made my heart flutter. So when I came across your letters nothing could keep me from them. It has been a rare joy the past week to be deep inside your writing filled with humor, intellect and your unique charisma. When faced with the nutzos that come with fame you handled them in a way that left them dazzled and slowly putting the pitchforks away. What can I say? I'm a sucker for a man with brains who makes me laugh. A collection of letters by Richard Feynman, ranging from private things to his loved ones to tips and answers to fans and students from all over the world. October 17 A collection of letters by Richard Feynman, ranging from private things to his loved ones to tips and answers to fans and students from all over the world. Seemita A heartfelt letter! Beautiful, Stian. Altaf Thank you for sharing it. This is my favorite of all the various Feynman books, because it's not cluttered up with Feynman playing the lovable, picaresque, eccentric. Instead of the slightly buffoonish public persona (or "curious character") he (or his publishers) seemed to feel compelled to present in his various autobiographical writings, the letters speak for themselves. And, to my mind, the picture they paint is ultimately far more flattering than that which he himself tried to present. Sure, there are lapses - he is This is my favorite of all the various Feynman books, because it's not cluttered up with Feynman playing the lovable, picaresque, eccentric. Instead of the slightly buffoonish public persona (or "curious character") he (or his publishers) seemed to feel compelled to present in his various autobiographical writings, the letters speak for themselves. And, to my mind, the picture they paint is ultimately far more flattering than that which he himself tried to present. Sure, there are lapses - he is not always charitable towards colleagues, he is sometimes impatient, and there is that characteristic unwillingness to suffer fools gladly. But the traits that shine through again and again in these letters, so much so that one has to think of them as his defining characteristics are generosity and graciousness. Over and over he takes the time to respond to strangers, who have written him out of the blue, with letters that are astonishing, both for their empathy as well as for the obvious care that he spent in writing them. Yeah, sometimes Feynman's a cocky jerk, but aren't we all? These letters are just so darn lovely and human. For as many (often justified) snotty replies he gives, there are just as many instances of unexpectedness tenderness and support for people in the same quest to figure things out. About a comment he made in the early '60s about the minds of women, he received loads of letters calling him sexist, an idiot, etc. When, in the more enlightened times of 1987, he was asked permission to reprint t Yeah, sometimes Feynman's a cocky jerk, but aren't we all? These letters are just so darn lovely and human. For as many (often justified) snotty replies he gives, there are just as many instances of unexpectedness tenderness and support for people in the same quest to figure things out. As the subtitle indicates, this is an anthology of Feynman's letters. This is one of the relatively few books that I have read based on a published review -- in this case, Freeman Dyson's review, anthologized in "Scientist as Rebel." I started browsing in these a few nights ago, on the theory of "I'd just read a few". A few hours later, I realized three things. First, I was utterly absorbed. Second, Feynman had a wonderfully clever and crisp prose style. Third, he was impressively thoughtful, sen As the subtitle indicates, this is an anthology of Feynman's letters. This is one of the relatively few books that I have read based on a published review -- in this case, Freeman Dyson's review, anthologized in "Scientist as Rebel." I started browsing in these a few nights ago, on the theory of "I'd just read a few". A few hours later, I realized three things. First, I was utterly absorbed. Second, Feynman had a wonderfully clever and crisp prose style. Third, he was impressively thoughtful, sensitive, and wise in his dealings with others. My only caveat about the book is that the context on both physics and biography is limited -- you will get much more out of the book if you have browsed in "Surely You're Joking..." or at least read the Wikipedia page about Feynman. Many of the letters are highly quotable, but here is my favorite. A former student had written to Feynman, and had commented that he wasn't doing anything important or notable. Feynman responded with a long and thoughtful letter. Here are two paragraphs that struck me very forcefully. "Unfortunately, your letter made me unhappy for you seem to be a truly sad. It seems the influence of your teacher has been to give you a false idea of what are worthwhile problems. The worthwhile problems are the ones you can really solve or help solve, the ones you can really contribute something to. A problem is grand in science if it lies before us unsolved and we see some way for us to make a little headway into it. I would advise you to take even simpler, or as you say, humbler, problems until you find some you can really solve easily, no matter how trivial. You will get the pleasure of success, and of helping your fellow man, even if it is only to answer a question in the mind of a colleague less able than you. You must not take away from yourself these pleasures because you have some erroneous idea of what is worthwhile." Very likely the finest book to emerge from the Feynman crap-publishing machine from which a public can't seem to buy enough (only QED The Strange Theory of Light could compare, and that's kind of a apples-and-oranges or, if you'll allow, baryons-and-leptons deal). An incredibly well-edited selection of great intimacy and scope, giving a much more insightful and indeed sympathetic look into the great man than his self-serving, posturing autobiographical releases. Richard Feynman yra ne vieno „geeko“ idealas: fizikas, Nobelio premijos laureatas, labai sveiko požiūrio į visokią pompastiką ir biurokratiją (nors kaip tik kiti sako, kad „pasikėlęs“), aštriai juokingas ir įžvalgus. Kitos jo knygos („Surely, You’re Joking, Mr. Feynman“, „What Do You Care What Other People Think“) yra labiau anekdotinių pasakojimų rinkiniai, o ši – dokumentinė jo laiškų rinktinė. Gal dėl to jį perskaičius Feynman atrodo labiau žmogiškas ir ne tiek užrietęs nosį: kartais jis pats Richard Feynman yra ne vieno „geeko“ idealas: fizikas, Nobelio premijos laureatas, labai sveiko požiūrio į visokią pompastiką ir biurokratiją (nors kaip tik kiti sako, kad „pasikėlęs“), aštriai juokingas ir įžvalgus. Kitos jo knygos („Surely, You’re Joking, Mr. Feynman“, „What Do You Care What Other People Think“) yra labiau anekdotinių pasakojimų rinkiniai, o ši – dokumentinė jo laiškų rinktinė. Gal dėl to jį perskaičius Feynman atrodo labiau žmogiškas ir ne tiek užrietęs nosį: kartais jis pats pripažįsta, jog savo pasisakymais yra perspaudęs, atsiprašo, supranta savo klaidas. Labai jaudinantys ir jo asmeniniai laiškai savo mylimosioms: pirmoji žmona sunkiai sirgo ir ji anksti mirė. Apie antrąją žmoną beveik neužsiminta, mat knygos sudarytoja – Feynmano įsivaikinta dukra, kuri atsirado jau jam gyvenant su trečiąja žmona. Sakoma, jog neilgai trukusi santuoka nutrūko dėl to, kad antroji žmona labai greit suprato, jog neįmanoma gyventi su žmogumi, kuris rytais pabudęs spręndžia diferencialines lygtis. Matyt, tiesos tame galėjo būti. Very good, and likely the best I've read of/by/on Feynman. I've always felt that the Feynman depicted in Surely You're Joking and Gleick's Genius felt pained – maybe a bit largely than life, if you will. While it's perfectly understandable, the picture of a fun-loving, quirky, womanizing physicist always felt overly romanticized. Reading his unadulterated communication felt voyeuristic, but my model of Feyman evolved and felt altogether more humanistic. An absolutely brilliant physicist and a ge Very good, and likely the best I've read of/by/on Feynman. I've always felt that the Feynman depicted in Surely You're Joking and Gleick's Genius felt pained – maybe a bit largely than life, if you will. While it's perfectly understandable, the picture of a fun-loving, quirky, womanizing physicist always felt overly romanticized. Reading his unadulterated communication felt voyeuristic, but my model of Feyman evolved and felt altogether more humanistic. I listened to this on cd. Professor Feynman had a fantastic sense of himself and his strengths, and weaknesses, and it is interesting to hear how he lived his life through his own words. The letters that he wrote, and were wrote to him, are well narrated and given a real life to them. It shows a man who knew exactly who he was and what honor, truth, and scientific research means without becoming egocentric or self-involved. Truly a fantastic audiobook and person. Feynman has become a cult figure for some, though I saw no evidence to support why this might have happened. The book was so thick, and he seemed so ordinary, I couldn't wrap my mind around the attraction. What a cool dude. I happened upon this book on my dad's shelf and it gave me giggles and chuckles, And it made me cry big dripping tears that landed in fat globs on the page. Feynman was awesome. I am addicted to Feynman. Everything about him, everything he writes, anything about his life its a total addiction! Can't get enough. Surely your Joking Mr. Feynman was still the best though. 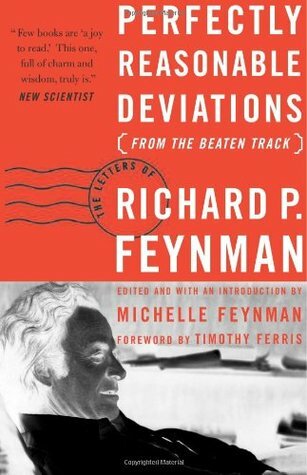 As you can tell by the title, Perfectly Reasonable Deviations... is a collection of letters written by Nobel-Prize-winning physicist Richard P. Feynman. To me, it was intriguing, and there are letters here that would appeal to anyone, but I think you'd have to be (like me) a Feynman fan already, anxious to know everything about the man, to enjoy reading the book from cover to cover. Anyone considering reading this book should first read Surely You're Joking, Mr. Feynman! Adventures of a Curious C As you can tell by the title, Perfectly Reasonable Deviations... is a collection of letters written by Nobel-Prize-winning physicist Richard P. Feynman. To me, it was intriguing, and there are letters here that would appeal to anyone, but I think you'd have to be (like me) a Feynman fan already, anxious to know everything about the man, to enjoy reading the book from cover to cover. This book is a collection of letters that were written to and by Richard Feynman, a great person, a Nobel laureate in Physics, a great iconoclast, and a beautiful, beautiful man. These letters span his lifetime, from his letters when he first left his parents to study at Princeton and MIT, to his love and wife Arline, and later to Gweneth among the many letters he wrote (and this surprises many that he did, and did so much). His willingness and excitement to communicate the most complex of proble This book is a collection of letters that were written to and by Richard Feynman, a great person, a Nobel laureate in Physics, a great iconoclast, and a beautiful, beautiful man. These letters span his lifetime, from his letters when he first left his parents to study at Princeton and MIT, to his love and wife Arline, and later to Gweneth among the many letters he wrote (and this surprises many that he did, and did so much). Well-organized and edited collection of letters, some to, most from Richard P. Feynman. Some of them are fascinating, some a bit dull, although which letters fall into which category probably depends on the reader. I most enjoyed the letters to his mother while in college; the congratulatory letters, and his responses, when he was awarded the Nobel Prize; his sharp responses to requests that he viewed as requiring him to violate his strongly-held principles (for example, asking him to attend a c Well-organized and edited collection of letters, some to, most from Richard P. Feynman. Some of them are fascinating, some a bit dull, although which letters fall into which category probably depends on the reader. I most enjoyed the letters to his mother while in college; the congratulatory letters, and his responses, when he was awarded the Nobel Prize; his sharp responses to requests that he viewed as requiring him to violate his strongly-held principles (for example, asking him to attend a conference in the USSR, or to receive an honorary degree), and his thoughtful responses to questions posed by serious students and crackpots alike. The section I liked least was the exchange of letters between Feynman and his (ill) wife during his Los Alamos years, which was just a little too personal for comfort. Some things should remain a couple's private domain. I did, however, love his description of witnessing the first atomic test. I've read very few books of letters, biographies, and autobiographies, so I'm very much in the early stages of calibrating my scales. This is a good book. Not every letter is scintillating or contains a gleaming gem. A minor few seem to be included only for completeness. I would have lost only a little, in one sense, by reading a booklet of the best ten or so. However, there are certainly gems to be found, some of them very fine, others more like nice shells you find on a beach and then hang ont I've read very few books of letters, biographies, and autobiographies, so I'm very much in the early stages of calibrating my scales. This is a good book. Not every letter is scintillating or contains a gleaming gem. A minor few seem to be included only for completeness. I would have lost only a little, in one sense, by reading a booklet of the best ten or so. However, there are certainly gems to be found, some of them very fine, others more like nice shells you find on a beach and then hang onto for a few paces before setting them back down. Some of the letters are incredibly moving, to the point that I wasn't sure I ought to be reading them, others are more straightforwardly touching, and most are at least a little amusing. So what you do gain from reading the extra 400 pages or so you are given here relative to that hypothetical best-of booklet, if not a wealth of extra wisdom or zany genius, is a gradually growing sense of warmth towards a man with a plain love for family, "Nature", teaching, and the joy of discovery, as well as a generosity of spirit that shines through. And if you're anything like me, you get fair bit of inspiration along the same lines. This collection of letters has brought me to tears in two separate instances. Once out of sadness, and once out of joy. The first instance was early in the book, when we are given insight into Richard Feynman's relationship with his first wife, Arlene, who for the adult part of their relationship was suffering from an, ultimately, fatal case of Tuberculosis. The letters to his wife were extremely touching, and outlined the great tragedy of it all. The second instance was while I read the last pair This collection of letters has brought me to tears in two separate instances. Once out of sadness, and once out of joy. The second instance was while I read the last pair of letters. A concerned father asks for advice on how to encourage his son's love for physics, as he was not doing very well. I will not defile's Feynman's response by trying to summarize it, for I can do it no justice. I will only remark on the fact that it gave me a great sense that there can be goodness, and compassion in this world. There is so much love,modesty,grace,intellect,humour,optimism,clarity of thoughts in Feynman's letters that you can simply admire and appreciate each of them.Some of them overwhelmed me and some of them kept me in awe.How wonderfully he would break difficult problems into small and comprehendible questions and answers.Feynman never failed to call himself a fool when he found out his mistake.The quest in him to find answers about the world about where we have come from is simply brilliant and pra There is so much love,modesty,grace,intellect,humour,optimism,clarity of thoughts in Feynman's letters that you can simply admire and appreciate each of them.Some of them overwhelmed me and some of them kept me in awe.How wonderfully he would break difficult problems into small and comprehendible questions and answers.Feynman never failed to call himself a fool when he found out his mistake.The quest in him to find answers about the world about where we have come from is simply brilliant and praiseworthy.It is unlikely you might not fall for him! and i was fascinated ever since! surely came by his constant excited expressions! and moreover LOVED sharing it! A brilliant perspective of one of the most popular person in the field of science. He had an appetite for life, an insatiable appetite for knowing things.All these is well shown through all the letters inside. You will know him better as you read all of them. Only one word : beautiful. Reading the letter conversations between Dr.RPF and his family, friends, strangers, students etc from the beginning till the end makes me appreciate his effort, brilliance and sincere heart. Some letters are fun, some are a bit technical but still very enjoyable to read. Some really nice moments in amongst this collection of letters to and from Feynman, particularly the ones where he talks about how you should go about doing science. The answer, apparently, is to do whatever the hell you want, and only what you want. Sweet! I'm in. Este libro me lo recomendó un amigo que me dijo: “para este libro hacen falta muchos marcapáginas, para ir ponendo uno en cada página memorable”. El libro es soberbio. Es una recopilación de cientos de cartas que Feynman mandó y recibió durante su vida. Siendo como era un hombre ocupado, y más a partir de recibir el premio Nobel (que siempre describió como una lata (a pain in the neck), porque le quitaba tiempo para enseñar e investigar), sorprende el volumen de su correspondencia. Su hija Michelle comenta por bloques las cartas, ordenadas cronológicamente y según las distintas fases de la vida de Feynman. Tal y como me recomendaron, llevaba marcapáginas de sobra. El consejo era de lo más acertado. En esta colección de cartas vemos a un hombre íntegro, divertido y sabio. Un tío dotado con una inteligencia poderosa y, sobre todo, con ganas de juerga (su inteligencia. Luego él la seguía). Decía que uno de sus deseos era olvidar cómo había resuelto algunos problemas para poder resolverlos otra vez de manera diferente. Te adoro, preciosa. Sé lo mucho que te gusta escucharlo. Pero no te lo digo sólo porque te guste. Te lo digo porque me hace sentir un calorcillo por dentro cuando lo hago. Hace muchísimo tiempo que no te escribo, casi dos años, pero sé que me perdonarás porque me conoces y sabes que soy tozudo y realista, y no le veía mucho sentido a escribirte. Pero ahora sé, amada esposa, que lo correcto es hacer lo que he venido retrasando tanto tiempo y que antes hacía tan a menudo. Quiero decirte que te quiero. Quiero quererte. Siempre te querré. Me es difícil comprender qué significa quererte cuando ya te has muerto, pero aún así quiero consolarte y cuidarte, y quiero que tú me consueles y me cuides a mí. Quiero tener problemas de los que hablar contigo. Quiero hacer pequeñas cosas contigo. Hasta ahora no me había dado cuenta de que podíamos hacer cosas juntos. ¿Qué podríamos hacer? Juntos empezamos a aprender a coser, aprendimos chino y nos compramos un proyector de películas. ¿Puedo hacer algo yo ahora? No. Tú eras la mujer de las ideas y la instigadora general de todas nuestras locuras. Cuando estabas enferma te preocupabas porque creías que no podías darme algo que querías darme y que pensabas que yo necesitaba. No tenías que preocuparte. Como yo te decía, te quiero tanto y de tantas maneras distintas que no me faltaba de nada. Y ahora es más cierto que nunca. No puedes darme nada y aún así te quiero tanto que sigues estando en el camino de mi enamoramiento hacia cualquier otra. Y quiero que siga siendo así. Tú, muerta, eres mejor que ninguna otra viva. Sé que me dirás que soy tonto y que lo que deseas es mi felicidad, y que no quieres interponerte en mi camino. Seguro que te sorprende saber que no tengo novia (salvo tú, cariño) dos años después. Pero tu no puedes hacer nada, querida, ni yo tampoco. No puedo entenderlo, porque he conocido a muchas chicas estupendas y no quiero quedarme solo, pero al cabo de dos o tres citas ellas se convierten en cenizas. Tú eres lo único que me queda. Tú eres real. Amada esposa, te adoro de verdad. Amo a mi mujer. Mi mujer está muerta. P.S. : Por favor, perdóname que no te envíe esta carta. No sé tu nueva dirección. Con el tiempo, Feynman volvería a casarse. Tuvo un segundo matrimonio breve y años después se casó con una inglesa, con quien tuvo a su hijo Carl (físico, como él, y con quien investigaría bastante en computación cuántica) y adoptó a su hija Michelle. El meollo del libro empieza cuando a Feynman le dan el premio Nobel y se convierte en una figura pública. Ya lo era antes, pues solía aparecer en la tele en programas de divulgación. Entre los estudiantes de física, y especialmente los del Caltech, Feynman era una leyenda mucho antes de que le dieran el Nobel. Tiene un libro de texto, en tres tomos, “The Feynman Lectures in Physics” (Las conferencias de Física de Feynman), que todo físico ha leído o está a punto de leer. Feynman recibe miles de cartas, y contesta muchas de ellas. Contesta incluso a los trolls que le acusan de salir en la tele para hacerse más famoso. Contesta a los niños que le preguntan cómo ser un gran científico. Contesta a los científicos que le preguntan cómo ser un gran científico. En todas sus respuestas se ve que Feynman no es físico por dinero, prestigio ni fama. Es físico porque se divierte. Feynman se metió en la comisión evaluadora de libros de texto de California, para dar su opinión sobre los libros de matemáticas y física de primaria. La transmisión del conocimiento fue una de sus principales prioridades. Rechazó una oferta el Instituto de Estudios Avanzados de Princeton (donde a la sazón estaba Einstein) porque allí no podía dar clase, no había alumnos, y él decía que si por algún casual perdía la inspiración, necesitaba dar clases para así, al menos, ser útil a la sociedad. Qué gran ejemplo de divulgador, estimados lectores. ¿Se acuerdan de la peli “Quiero ser como Beckham?”, Bueno, pues yo iría a ver diez veces “Quiero ser como Feynman” (Explain it like Feynman, en inglés, contrapuesto al Bend it like Beckham de la película original). También hay cartas muy divertidas. Feynman tenía un viejo pique con los matemáticos desde sus tiempos de la universidad. Decía que “si pones un teormea matemático en palabras de la calle, queda algo ridículamente obvio”. Por ejemplo, tomemos el Teorema de Bolzano: Si f(x) es continua en un intervalo y cambia de signo en el interior del mismo, existe un punto c perteneciente al intervalo en el que f(x)=0. En palabras de la calle, esto queda “Si ahora es de día y luego es de noche, en algun momento ha anochecido”. O bien “Si ahora estás en la playa y luego estás buceando, en algún momento habrás cruzado la superficie del mar”. Era un cachondo, el Feynman. Un ex-alumno suyo le escribió cuando ganó el Nobel. Era decano de la facultad de matemáticas de una prestigiosa universidad y le escribía para felicitarle y darle las gracias por sus clases, que lo habían llevado hasta el cargo que ocupaba. Feynman respondió diciendo que “Veo que mis clases no sirvieron para nada, pues has acabado dirigiendo una facultad de matemáticas. Seguiremos intentándolo”. Otra carta divertida es la que le mandó su editorial (Addison-Wesley) cuando ganó el Nobel. “Felicidades por el Nobel. Por fin en Suecia reconocen un buen libro de texto”. La respuesta de Feynman: “Muchísimas gracias. No tenía ni idea de la enorme influencia que teníais sobre el comité de los Nobel. Prometo no vover a subestimar el poder de una editorial. Gracias a todos los que habéis ideado y ejecutado esta fabulosa maniobra publicitaria”. Un crack, como les digo. Una carta más, bastante reveladora. De Feynman a la comisión que otorga el premio Einstein, que le pedía su opinión sobre Hawking: “Creo sinceramente que el trabajo del Dr. Stephen Hawking le hace acreedor del premio Einstein”. (Se lo dieron). Odiaría tener que morirme dos veces. Es aburridísimo. I'd already read a couple of other books about or by Feynman so I feel I didn't learn much new here. (1) His persistent efforts to resign from the National Academy of Science. (2) The amount of effort he put into corresponding with random strangers who mailed him. But I think only a very dedicated Feynman-phile will find it worthwhile to read all the correspondence. If it was me, I would have edited them down and only shown the ones that were really i I'd already read a couple of other books about or by Feynman so I feel I didn't learn much new here. If it was me, I would have edited them down and only shown the ones that were really interesting. Still, Feynman was quite a character, with a lot to admire. The letters are a pretty good way of seeing his character without filers: very independent, diligent, earnest, with unbending rectitude and a hatred of pretentiousness. In his past books I found Feynman's humor and character pleasant and funny, however, I couldn't enjoy this one. 2.) It is a collection of Richard's mails curated and narrated by her daughter. You can read his correspondence with his mom, wives, colleagues, and strangers. Nor the mails nor the narration were particularly interesting to me. In fact, I felt like a voyeour, or some tabloid reader. I did not find the aspects I liked in previous In his past books I found Feynman's humor and character pleasant and funny, however, I couldn't enjoy this one. Starting the book I was fascinated by the stories the letters tell of a most extraordinary man. I continued to read with enthusiasm, but after a while the letters seemed to repeat quite a bit, especially in the responses to congratulatory letters. A fantastic man, a too-long collection. Absolutely one of the best books I have ever read. A glimpse into the life of one of the true greats of the scientific world! Unconventional, witty and charming, Feynman has a wonderful and unique view of the world and the people in it. His takes on the events around him and his attitude towards life are truly magnificent. I aspire to live life with the same commitment, joy and curiosity he had. This was a really great view into the life of Richard Feynman. The book is broken up into time-frames from early life until death and you see letters to and from him to family members and associates. We hear about his marriages, the atomic bomb, his Nobel Prize, and the Challenger disaster. If you like Richard Feynman, you'll definitely enjoy this book. Richard Phillips Feynman was an American physicist known for the path integral formulation of quantum mechanics, the theory of quantum electrodynamics and the physics of the superfluidity of supercooled liquid helium, as well as work in particle physics (he proposed the parton model). For his contributions to the development of quantum electrodynamics, Feynman was a joint recipient of the Nobel Pr Richard Phillips Feynman was an American physicist known for the path integral formulation of quantum mechanics, the theory of quantum electrodynamics and the physics of the superfluidity of supercooled liquid helium, as well as work in particle physics (he proposed the parton model). For his contributions to the development of quantum electrodynamics, Feynman was a joint recipient of the Nobel Prize in Physics in 1965, together with Julian Schwinger and Sin-Itiro Tomonaga. Feynman developed a widely used pictorial representation scheme for the mathematical expressions governing the behavior of subatomic particles, which later became known as Feynman diagrams. During his lifetime and after his death, Feynman became one of the most publicly known scientists in the world.